Indulge yourself in the historic cradle of France, with famous castles that mark their way along the Loire: Cook in a Walnut Grove, explore local markets for fresh produce, learn cooking from our Master chef and savour a six-course gourmet dinner each night, paired with finest Loire wines. This idyllic rural French farmhouse nestled in a walnut grove is the perfect setting for an intensive culinary course and to gain confidence in a French kitchen. Travellers who like to join a small group of like-minded companions to share the experience with. 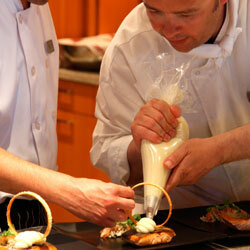 If you are looking for daily cooking classes and excursions, and don’t want to worry about logistics. We will take care of everything! 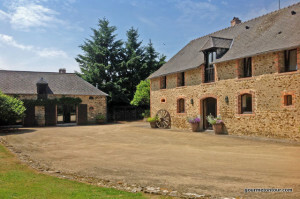 The charming farmhouse is nestled in a Walnut Grove in the Loire, ideally situated near the boarders of Brittany and Normandy and just a drive from the Valley of the Loire with its romantic castles. 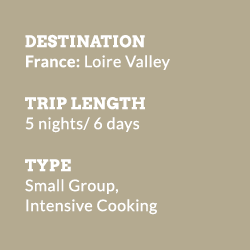 It is a charming retreat in an unspoilt region – a perfect location for an intensive gourmet experience! There are plenty of places of interest to discover in the area –from the beautiful Basilique Notre Dame d’Avesnières in Laval, dates back to before the 11th century to the chateaux such as Château de Craon, Château d’Angers and Château and City of Vitré. 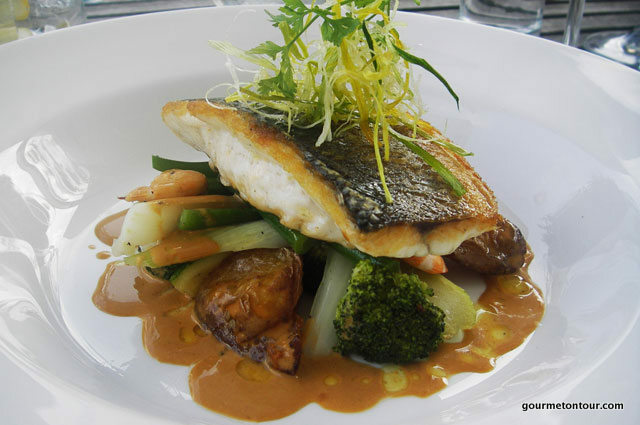 Enjoying cooking is all about confidence, being relaxed and understanding your ingredients. Skilfully combining flavours, textures and presentation is within all of us, our aim at the Walnut Grove is to bring these qualities out, so that you have the ability to follow your own flair and imagination. Our professionally equipped kitchen is just across the courtyard from the farmhouse and has been specifically designed for your cookery holiday. With a high ceiling and exposed beams, our large kitchen is light and airy and is ideal for learning to cook. And we all share a healthy sense of humour so you can be sure of plenty of laughter! This is where friendships are formed. Dinner each evening is a six-course gourmet dinner, with fine wine and intimate conversation. The first evening’s six-course gourmet dinner is an introduction to the culinary themes covered by the week’s cookery course, hosted by our two modern chefs who use the freshest ingredients with an emphasis on distinct flavours and clean, meticulous presentation. Daily courses begin with a demonstration followed by a hands-on class, with preparation of the gourmet dishes for the evening meal. Your tutor for the week is an acclaimed English chef. Talented, professional chefs with a deep understanding of food and decades of experience at top restaurants, he will share his passion for fresh ingredients, distinct flavours and clean, meticulous presentation. 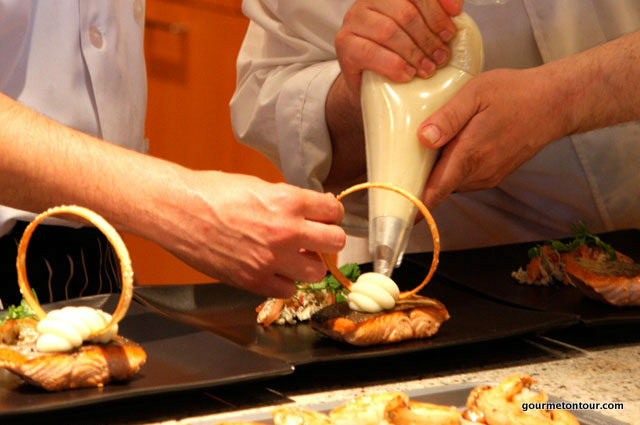 Chef Maynard experience includes working with Chef de Cuisine Richard Brooks (Princess Diana’s personal chef), and at the prestigious Savoy Hotel, London. Most recently Maynard was the chef/patron of the award-winning restaurant Seland Newydd. Detail is what he is about and as well as sharing his expertise. He also believes that cooking should be some thing that’s fun, so expect plenty of laughter with him. This beautiful property and tranquil grounds are surrounded by a walnut grove. The professionally equipped kitchen is located across the courtyard from the farmhouse and has been exclusively designed for the use of course participants. With a high ceiling and exposed beams, the large kitchen is light and airy and retains a soft country ambiance, as does the beautifully renovated farmhouse, which has an open fireplace, and four lovely en-suite bedrooms with stunning views stretching over the country side. A personal butler is always on call. Additional dates available for small groups upon request. The closest airport is Rennes which is a 1hr drive. St Malo/Dinard is 2hrs drive, Paris is 3 to 4hrs drive. There is a fast train (TGV) between Rennes and Paris, stopping at Laval station. We arrange transfers from Laval at recommended times. There is a fast train (TGV) between Rennes and Paris, stopping at Laval station. We arrange transfers from Laval for the 15.36 train (Leaves Paris at 14.00) only. For the return train on Thursday we provide transfer for the train that leaves Laval at 11.41 to Paris. Each day, you’ll experiment with new flavours and new techniques using the freshest ingredients with expert guidance. Our courses are run with a professional yet relaxed holiday atmosphere, we believe that this is the ideal way of combining a holiday with culinary development. You’ll arrive on Saturday, mid afternoon. After some time settling in to your room, the course begins with an introductory talk to discuss the structure and goals of the program. Later in the evening, after complimentary champagne, you’ll enjoy a 6-course gourmet dinner that illustrates the cooking style you’ll be studying during your cookery course, with explanations by your chef hosts. It’s also a wonderful opportunity to relax and get to know your fellow guests. 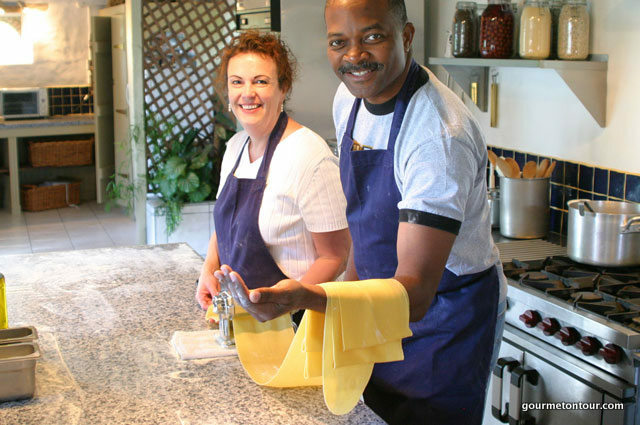 Each day after breakfast, there will be both demonstrations and hands-on classes, ranging from basic knife skills to homemade Italian bread’s and even caramelised sugar baskets. This is followed by preparation of the evening meal, with gourmet dishes such as apple & goats cheese croustade with a roquette & walnut salad or Collops of monkfish glazed with a herb, mustard & brioche crust, served with saffron tagliatelli and a white wine, mussel and dill sauce. On Monday after a light lunch, you’ll get to enjoy some of the local culture with a visit to a 19th century windmill producing buckwheat flour in the traditional method. On Tuesday afternoon we have a master French pâtissier, Anthony Vancilli who will come to the Walnut Grove and teach you the secrets of making traditional all butter croissants and a French favourite – macaroons! Early evenings are all about more hands-on fun in the kitchen, as you put the finishing touches on dinner, learning last minute cooking techniques and high quality restaurant presentation skills. It’s then time to sit down and revel in the stunning food you’ve learned to prepare. On the last day, you’ll be challenged to use all the skills and knowledge acquired during the week as you work in teams to prepare and present the last meal with only a little guidance from the chefs. To relieve the pressure, a gourmet barbecue is served in the afternoon, followed by a game of croquet or boules in the garden. Then back to the kitchen for final preparations before sitting down to your gastronomic feast. One of the best courses I have ever done! Jenni Muir, author of ‘A Place to Cook’ and ‘Cooking School Holidays’ and ex-chairman of the British Guild of Food Writers Association. “I am happy to say that I have come to have great faith in your brand. I enjoyed Walnut Grove and I got a lot out of it. The instruction is well designed as an advanced course in as much as it focuses on the things that underlie good cooking. The emphasis is not so much on putting food on the plate as on the elements and processes that are the foundation of great dishes. I also liked the emphasis on menu planning and pushing the students to create their own dished. Maynard and Benedict inspire confidence, and they are highly personable and a pleasure to learn from. I also think that, outside of the kitchen, they run a good establishment so the “off-duty” hours are spent in ease and comfort. I’d be happy to recommend Walnut Grove’s advanced course to anyone who wants to do some serious cooking in a pleasing environment. “Firstly I liked to say thank you for your help and suggestion. Without your prompt emails my vacation would not have been possible. Walnut Grove was magical. Maynard, Freya and Bernidict were the perfect hosts. 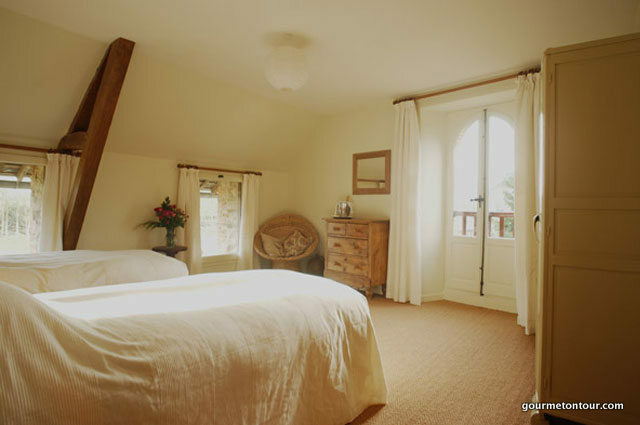 The farm house was beautiful and cosy…. We all bonded really well and enjoyed each others company. The cooking and teaching was great. The food we cooked and ate were delicious-scrumptious. I did wonder how I would manage six courses each night but rose to the challenge. My favourite was the lemon tart dessert served with coconut parfait and honey wafer. I would highly recommend Walnut Grove to anyone looking for a holiday who enjoys cooking and making new friendships. Loved my time and miss everyone dearly. Walnut Grove will hold a fond memory in my heart for my first solo vacation. “Couldn’t’ be happier with our experience. Accommodations lovely, no scrimping on foods (actually excessive amounts of food according to my scales this morning) and a perfect balance of learning and relaxation. Would wholeheartedly recommend to all age groups. “We had an over the top experience, and appreciate that Freya, Maynard and Benedict gave more of themselves than they normally do, hanging with us the last night, dancing and drinking and laughing. It was funny to see Maynard be so serious the first day, and then mellow out and have fun with us. We were a small group, so it meant we had more one on one time. I would recommend this course to anyone who is interested in pretty, French, detailed and delicate cooking. “It was a great tour. Maynard, Benedict and Freya were very knowledgeable, and caring. The trips to the fromagerie and wind mill were great fun. I love history and preservation so they were a wonderful tie in. 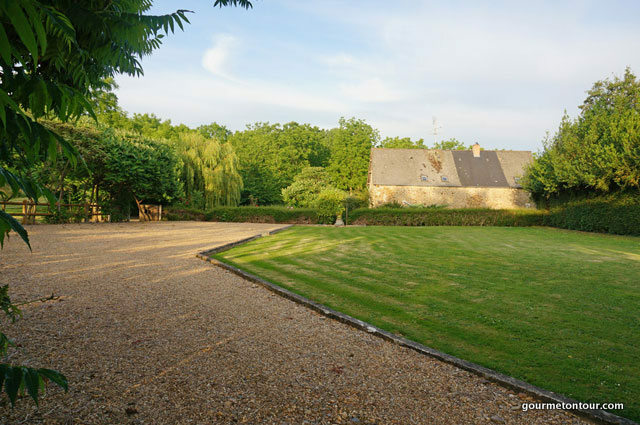 The location, out in the country (Loire valley), was quiet and beautiful, gently rolling hills, lots of muted fall colors. The accommodations are comfortable, like visiting a friend’s home. We worked hard and learned a lot. I made the vierge salad dressing last night. I have to go kitchen tool shopping! I have a new best friend in Tokyo!